Condominiums stand illuminated at night near the CN Tower in Toronto, Ont., on Friday, May 26, 2017. 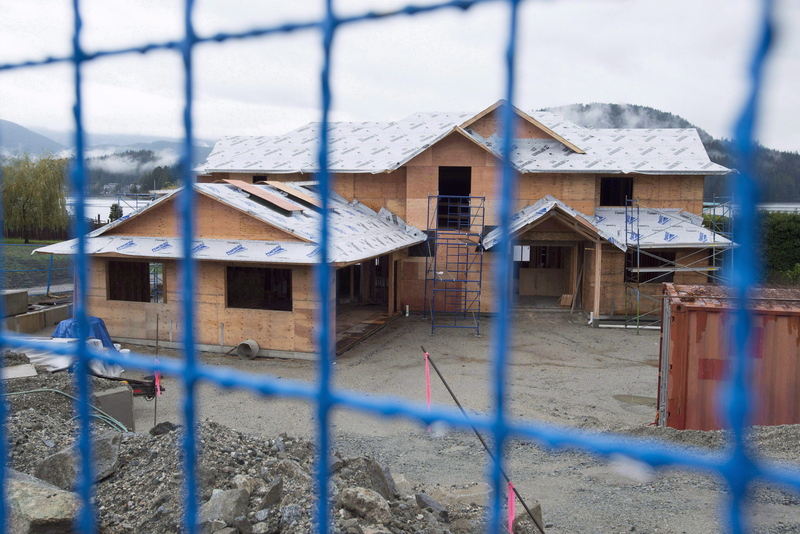 A new home is under construction in North Vancouver, B.C. Thursday, Oct. 27, 2016. Supply measures like the Airbnb restrictions have been popular with the general public, but strangely, building more homes is often met with fierce opposition, due to heritage considerations, infrastructure costs, environmental concerns, building shadows, parking issues, or the architectural style. However, the largest complaint is that the prices or rents are too high and unaffordable, and many hold the opinion "why even bother building this luxury housing?" The problem with this anti-development stance is that even if you eliminated all 99,000 homes that are "unoccupied by usual residents" in the Toronto Census Metropolitan Area (every second home, vacation property, Airbnb suite, student rental, or house being renovated) and those homes were sold, rented, or otherwise occupied by full-time residents, that supply would represent less than three years of supply. Excluding new rentals, the Toronto CMA absorbed 98,753 new housing units between January 2015 and July 2017, according to CMHC. Therefore, you have to build to increase supply over the long run. But new housing is expensive because the input costs are expensive. The average high-density land sale in the City of Toronto over the past year was $9 million, or equivalent to $70,000 per unit (via Altus Group transaction data). The government charges alone account for $80,000 per unit, according to Altus Group's cost consulting division. You have to build to increase supply over the long run. But new housing is expensive because the input costs are expensive. Construction costs account for 40 to 50 per cent of the end-selling price, or about $160,000 for an 800-square-foot high-rise apartment. If we add in "soft costs" like planning, architecture, engineering, marketing, and sales commissions, that adds another $90,000 to the price. That's $400,000 before a developer has made a dime. If a developer buys land for $9 million, about $1.35 million would be needed for the down payment and working capital (15 per cent). A 65 per cent land loan with a bank ($5.85 million) would cost the project $30,000 per month in interest, which is burdensome when the planning approval process is getting longer. The other 20 per cent required to purchase the land may come from the developer's equity partner, and they're likely entitled to the first profits the project spits out. Even when the developer gets planning approvals, and secures adequate sales to qualify for construction financing, they'll likely have to pledge their corporate assets or even their personal assets to secure this funding. Cranes operate at a condominium under construction in Toronto, Ont., on Saturday, May 27, 2017. The developer is taking on a lot of risk building a project (building a rental brings even greater market risk), and therefore they will look for a higher "risk-adjusted" return. That said, there is no way a developer would even get financing if the project wasn't significantly profitable for both the borrower and the lender. The only real way to reduce costs is via the land price or the construction costs. However, there is a strong plan by the Ontario government to reduce sprawl, which has resulted in fewer projects on cheaper outer-suburban land that is built with less expensive wood-frame materials. Growth is directed to areas with transit access (the most expensive land), and into tall concrete towers that are more expensive to build. As all the city parking lots and low-rise strip malls get redeveloped, and prime, easy-to-develop properties disappear, land and construction costs will continue to rise. Fighting demand has proven to be a losing battle in many international communities, as it can hurt individual purchasers in the short-run and even choke off future supply. Measures to promote supply are needed, but the resulting new-build supply won't be cheap. The long-run outlook for Toronto and Vancouver is much higher prices.